Today with students of the German University of Technology Oman (GUtech) at HafenCity. Explanations of the Elbphilharmonie, which has disappeared in the fog. 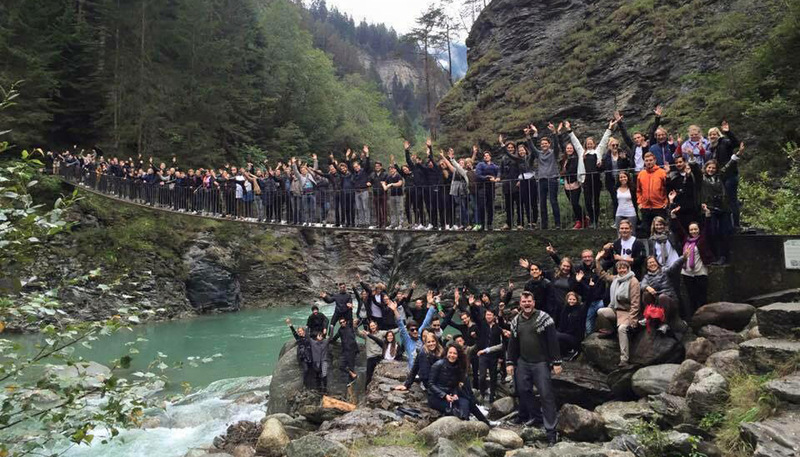 Our Zurich network partner ARCHITOUR toured 115 BIGsters from Copenhagen and New York in three BIG busses over six days in Switzerland! Danish client REALDANIA and its 9 PAX local interest group Ejerboligforum participated in a 3-days program develped in co-operation from a-tour and our guiding-architects partner scaledenamrk. 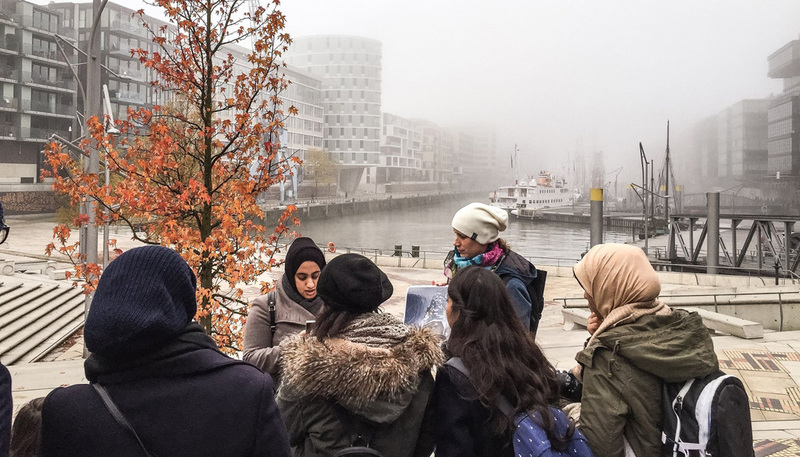 The group was exploring the former stigmatized and now up and coming neigbourhood Wilhelsburg – transformtions within the city of Hamburg as well as the all an above Hafen City with its future crown jewel Elbphilharmonie. Despite the diversity and individuallity of the group it semed that the majority was able to discover and bring take aways home from the trip! 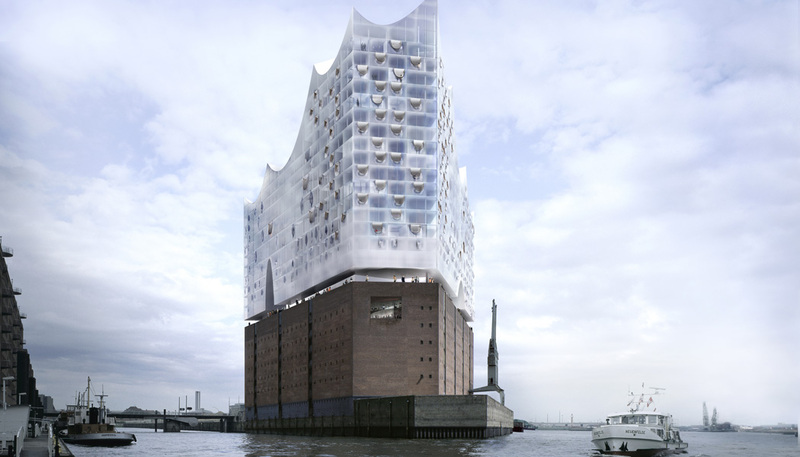 Elbphilharmonie Concert Hall will be a unique landmark for Hamburg. Swiss star architects Herzog & de Meuron are erecting a spectacular concert venue within the walls of mighty Kaispeicher A, a cocoa warehouse built between 1963 and 1966 by architect Werner Kallmorgen. However, construction of the concert hall was interrupted since 2008 by disputes between the developer and the building contractor. 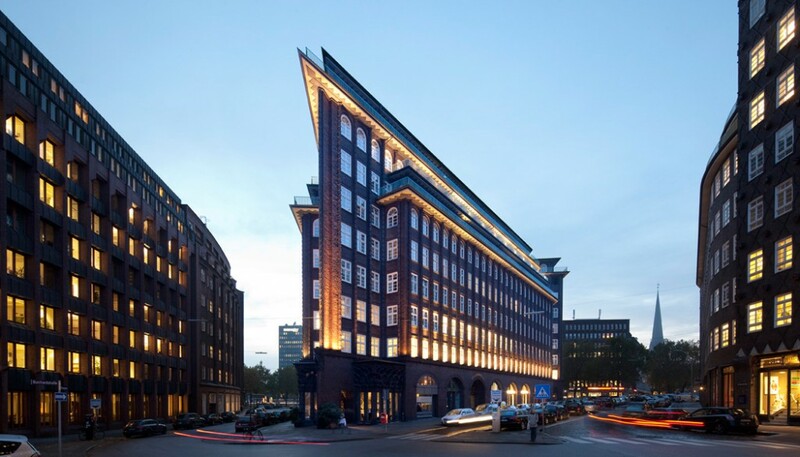 In April 2013 the City of Hamburg finally approved a new organization of the project, which guarantees completion of the whole building by the end of October 2016. Although the core of the old Kaispeicher A was completely removed, its cubic shape and brick façades remain intact. Thus, a worldwide unique architectonic hybrid is emerging, which will also house a five-star hotel, a conference center and 45 apartments. The former warehouse will be crowned by an undulating, curved and inclining glass structure, blending historic port architecture and contemporary architectural creativity, port tradition and the district’s new identity. A public plaza offering fantastic views of the harbor, HafenCity, the River Elbe and the city will take shape at a height of 37 meters on the brick building below the new glass structure. Two thirds of the gutted warehouse will be used for car parking, but backstage areas and places for musical education will be accommodated here as well. The new glass superstructure, almost 110 meters high, will contain two large auditoriums holding audiences of 2,150 and 550 respectively. The Elbphilharmonie Concert Hall will become a unique location for performances of classical music, music of the 21st century and sophisticated musical entertainment. The opening is now scheduled for spring 2017.
built from the 1920s to the 1940s to house port-related businesses. The complex exemplifies the effects of the rapid growth in international trade in the late 19th and early 20th centuries. UNESCO has appointed Hamburg`s Speicherstadt and Kontorhausviertel to World Heritage Site. The World Heritage Committee decided the admission at their meeting in Bonn last Sunday. monuments in Germany on the Unesco World Heritage List. Worldwide there are over a thousand. 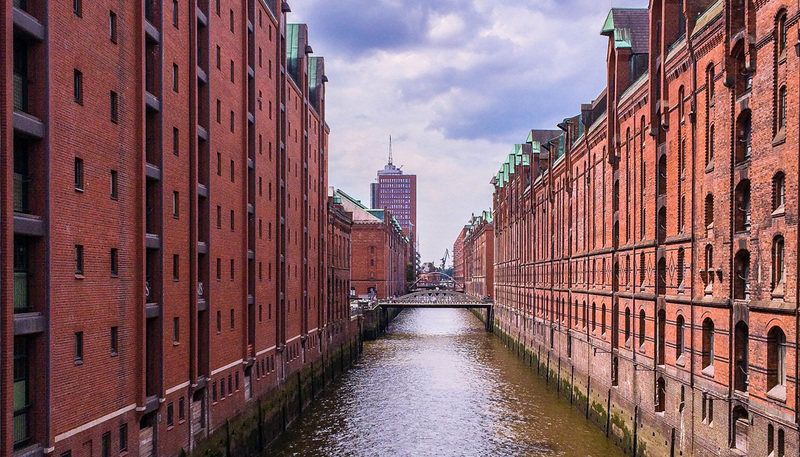 The Speicherstadt and Kontorhausviertel are already one of the tourist highlights in Hamburg. The appointment to World Heritage site will contribute to a considerable extent to the international publicity of Hamburg. 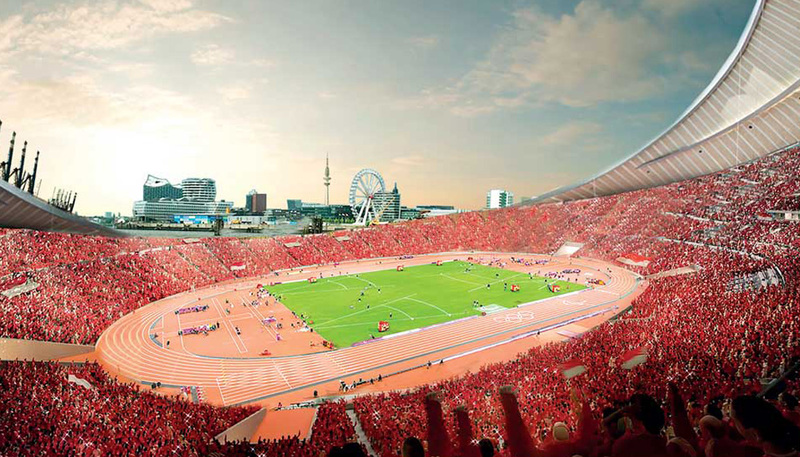 Hamburg is the official German nominee for hosting the 2024 Olympic and Paralympic Games. Part of the plan is to use the Kleiner Grasbrook area, which is technically an island but within easy walking distance from downtown, for the Olympic park. On 23 June, the architects and planners involved will invite the general public to view and discussing the draft of the future masterplan for Kleiner Grasbrook and to hear about latest developments in regard to Hamburg’s Olympic bid. Ever since its beginnings in 2004, the Guiding Architects network has held an annual meeting in one of its member locations. 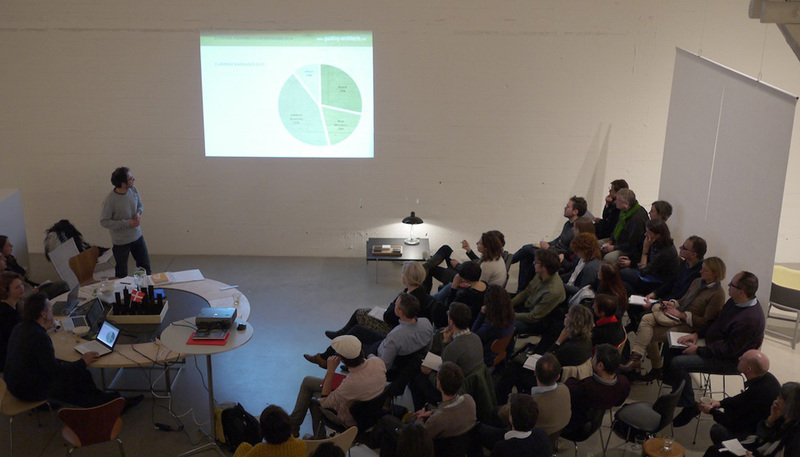 From 20 to 22 February 2015, the 11th Guiding Architects meeting will take place in Turin and Milan. At the meetings, the partners from all our destinations get together for a few days, making new plans for the network and exchanging experiences and ideas for their guiding businesses. New members present themselves and get to know the others. 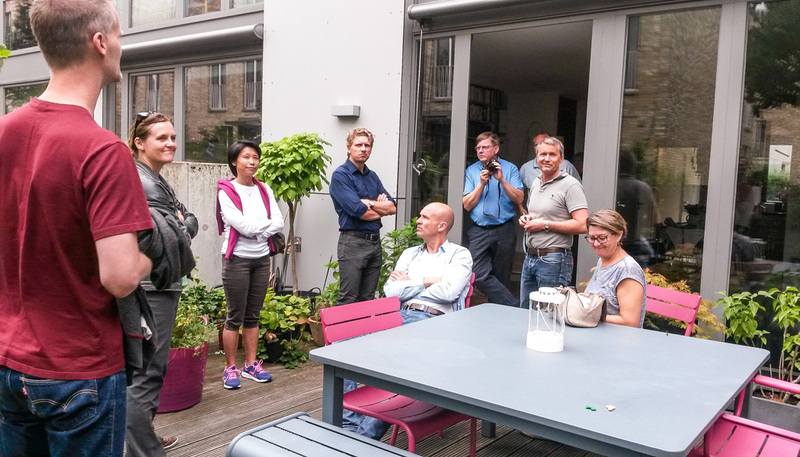 Most importantly, though, there’s a lot of socializing going on, and there’s also a chance to get to know the destination during guided architecture tours, provided by the local partners. So far we’ve had meetings in Zurich, Berlin, Vienna, Porto, Rome, Ruhr area, Barcelona, Athens, Dubai, Istanbul and Copenhagen. 2015 the meeting will be organized by our partner To(ur)arch from Turin. We’re looking forward to some productive sessions, meetings with old friends, visits to spectacular architecture and, of course, great Italian food and wine!